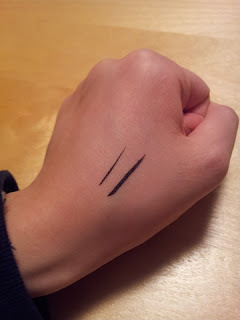 I couldn't stand using my Bobbi Brown gel eyeliner anymore and I wanted to switch to a liquid eyeliner. Don't get me wrong, I like how long lasting the BB gel eyeliner. But for some reason it takes me forever to apply it. 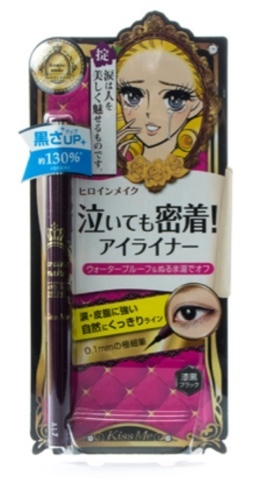 So I end up going on to sasa.com to look up what kind of Japanese brand liquid eyeliner is available. After reading some of the comments and price range, I end up wanting to give it a try on the "Kiss Me Heroine Make" liquid eyeliner. The liquid dries pretty quickly after applying and it's a dark solid black. I like how the brush itself is very thin, making it easy to apply even to the thinnest line. I tired rubbing it with my finger and there was no sign smudges *thumbs up*! Although I have never cried when wearing this eyeliner, I tried putting a few drops of water on it and its still perfectly safe! However, when water + rubbing = eyeliner completely erased. Have anyone tried this liquid eyeliner? Let me know!